A gentle holistic therapy that uses reflex points on the feet to detect and restore imbalances within the body, and to stimulate and encourage the body’s natural healing abilities. Your treatment will include a variety of advanced techniques, such as vertical reflex therapy and precision reflexology, to increase the effectiveness of the treatment. Each treatment will be tailored to meet your needs. You may be taught self-help techniques where appropriate that you can use at home to maximise benefits between your treatments. Facial Reflexology works in the same way as foot reflexology, just on your head and face instead. It is a non-invasive treatment, working each reflex point and identifying areas of tension or imbalance. As well as the benefits of reflexology, it has a gently rejuvenating effect on your face, easing tension, increasing circulation and leaving your skin smoother, brighter and glowing. All treatments include a mini-organic facial. Our Facial Rebalance helps to rebalance your body and bring about a feeling of deep relaxation and calm, helping to alleviate stress and leaving you with an increased feeling of wellbeing. The perfect treatment for both mind and body. Otherwise known as RLD, this is an award-winning technique which focuses on stimulating the lymphatic reflexes in the feet. It was developed specifically to help post-breast cancer lymphoedema but has been used to ease many other conditions to great effect. The aim of the unique RLD sequence is to cause an effect on the lymphatic system in the body and has been researched and developed by Sally Kay whilst working in cancer care. In cases of lymphoedema, the affected limb is measured before and after an RLD treatment to gauge the loss of fluid and improvements. Reflexology Lymphatic Drainage is used to treat other conditions than lymphoedema including arthritis, chronic fatigue, fibromyalgia, ME, sinus problems, migraines and headaches, muscular tension and PMT. Through Nurture 4 Life we offer a range of reflexology treatments for you at all stages throughout your journey to parenthood and beyond. This includes Reproductive Reflexology which is used to work alongside both you and your partner at any stage of your fertility planning, Maternity Reflexology to help ease the physical and emotional strain of pregnancy and maximise the health of you and your baby, post-natal reflexology to help your transition into motherhood and Reflexology for Babies and Children. Visit our Nurture 4 Life website to find out more. Got lots of questions? Want to find out more? Then let’s have a chat. This will be completely free of charge and without any obligation whatsoever. During our conversation I will learn more about your personal situation and you will learn more about the different ways in which we can help. By the end of our chat you will have had all of your questions answered and you will feel more in control of your situation and more confident in the different options available to you. Alternatively, if you know exactly what treatment you would like then please get in touch and we will get an appointment booked in the diary. 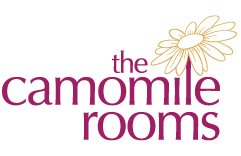 Call me on 01242 227752 or email me at info@thecamomilerooms.co.uk. "My previous experiences with osteopaths at different practices have felt invasive and forceful with lots of bone-crunching. Not here! She was gentle, spending time coaxing my muscles and joints back into alignment. I have had considerable pain relief, advice on an exercise programme and how to achieve the active lifestyle I want without incurring further injuries." "I had a rotator cuff injury causing me constant pain and discomfort. Not only was this eased after just one session but has helped ease a lower back pain that I've suffered with for many years." "I had problems with my sinuses that were starting to affect my everyday wellbeing. Thanks to my treatments, this is now clear. My regular therapies keep problems at bay and are also very relaxing treats." "It has been life-changing due to the treatment of the cause and not the effect of my condition. This has led to long-term stabilisation and not short-term correction." "I took advantage of the generous three free sessions offered to cancer patients and found it so relaxing that I have continued ever since. Such a positive experience, so helpful. I feel that my treatments give me much appreciated 'me time' and by discussing things beforehand I am able to feel pampered too." "I have been more than happy and seriously grateful for the support and advice I have received. All therapists sincerely cared about my recovery and had no hesitation in giving their time and advice. I went to doctors and physios but it was only be coming to the Camomile Rooms that I made a significant improvement on my road to recovery."